The third year of the five-day Door Kinetic Arts Festival (DKAF) is slated to begin next Monday, but before festivities kick off, there was one important detail yet to be decided: what will the official cocktail be? 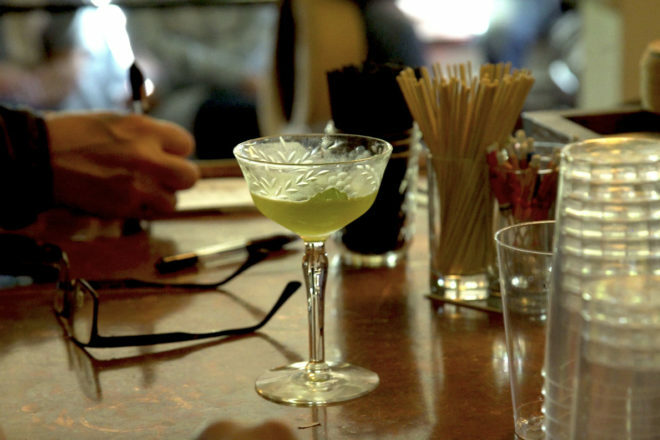 Festival founders Alan Kopischke and Eric Simonson tasked New York Times cocktail writer Robert Simonson with the important duty. You might ask, why should a festival have an official cocktail? Robert would respond, “well, why not?” Touché, sir. Thus, the DKAF Cocktail Competition was born. 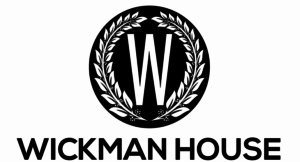 The Wickman House, an establishment credited with bringing the craft cocktail resurgence to Door County, hosted a selection of seven of Wisconsin’s finest craft cocktail bartenders in a competition sponsored by Death’s Door Spirits. The arts festival begins June 11 at Björklunden in Baileys Harbor and will feature an official cocktail presentation Wednesday, June 13 at 7 pm. Each contestant prepared one drink for the panel of three judges including DKAF founder Eric Simonson, his brother Robert, and Wickman House owner Mike Holmes. 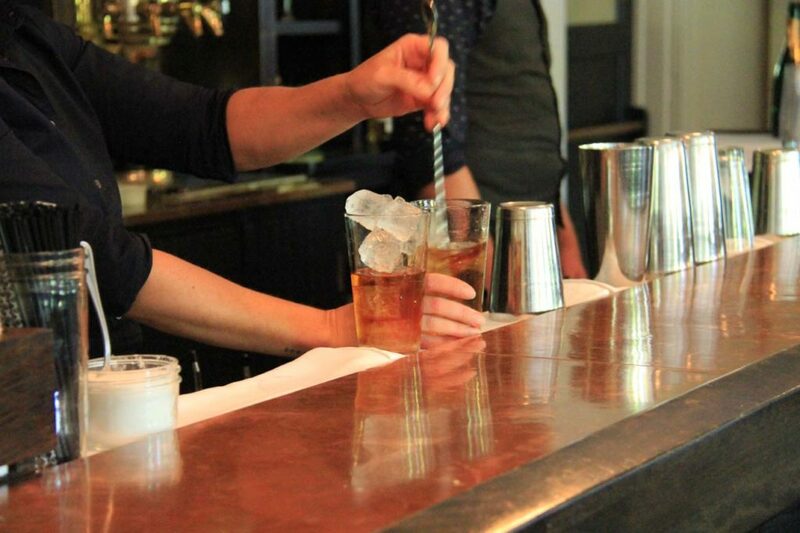 Bartenders began by describing the inspiration behind each craft cocktail, how it ties into DKAF and what ingredients were used. 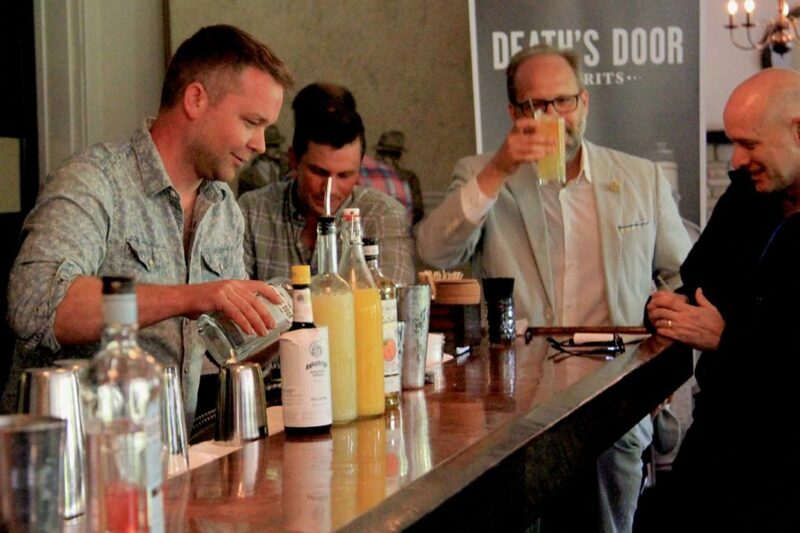 Death’s Door Gin was used as the base ingredient. Duo Travis Ward and Kayla Larsen from Wickman House in Ellison Bay created “Slow Death,” a spirit-driven cocktail with gin, blood orange juice, wild beach plum liqueur, brandy, simple syrup, Bogart’s bitters and a chartreuse rinse. A dried orange slice was added for the presentation. 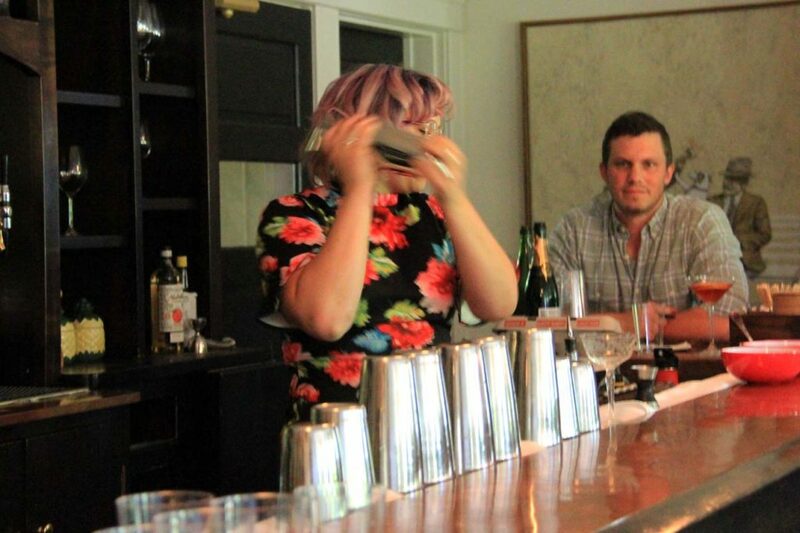 Mackenzie Ross of Bryant’s Cocktail Lounge in Milwaukee served “Freya’s Love” after finding inspiration in Door County’s Scandinavian heritage. Her creation used gin, lingonberry syrup, egg white, fresh lemon juice and was topped with a sage leaf. 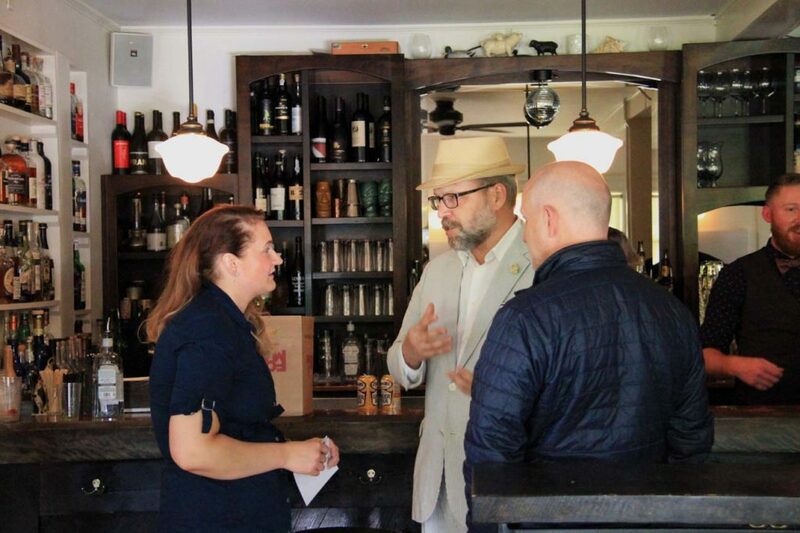 Michael Termini of Chop in Sister Bay presented “Blockbuster Buck” after recounting an infamous murder tale that culminated in the county mid-1990s. The cocktail used gin, fresh lime, Seaquist Orchards cherry juice infused with habanero pepper to add heat, Barritt’s Ginger Beer and a pick full of Door County cherries to garnish. Chad Vogel of Madison’s Robin Room and MintMark made a “Fuzzy Sunset” that took inspiration from his laidback summers in Door County. The cocktail was a blend of peach liqueur, orange juice, gin, fresh lemon juice and a few drops of Angostura bitters. Danielle Wacek from The Libertine in Green Bay crafted “The Safe Word,” which was her take on an old cocktail titled “The Last Word.” Described as fun and dangerous, the drink was made of gin, fresh lime juice, melon liqueur, Thai basil syrup, a wash of absinthe and garnished with a mint leaf. The final contestant, Mark Waldoch of Boone and Crockett in Milwaukee, served a “Sunshine Now” drink, taking notes from classic gin-based cocktails The Alaska and The Bronx. Using yellow chartreuse, gin, sweet vermouth, orange juice, orange bitters, a wash of absinthe, and topped with raspberries, the drink is a lively yellow color. 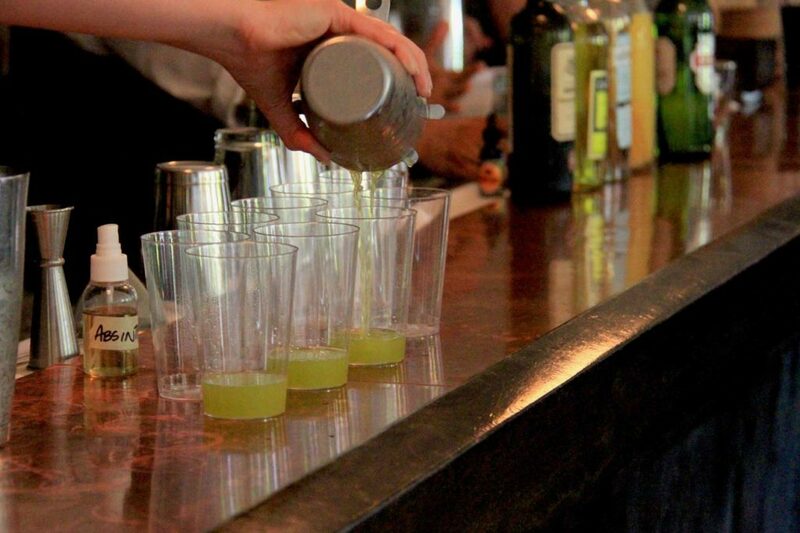 The official drink will be served to attendees of the festival on the evenings of June 13-15. Daily and full event passes are available online at doorkinetic.com.